The Academy of Motion Picture Arts and Sciences has announced X JAPAN's "LA VENUS" as one of the songs in contention for a nomination for this year's "Best Original Song" at the 89th Academy Awards®. YOSHIKI--songwriter, drummer, classically-trained pianist and the creative force of X JAPAN--wrote "LA VENUS" for 'WE ARE X,' the critically acclaimed music documentary on the iconic Japanese rock group X JAPAN. The nominations for the 89th Oscars® will be announced Tuesday, January 24, 2017. The Oscars® will take place Sunday, February 26, 2017 at the Dolby Theatre® at Hollywood & Highland Center® in Hollywood and will be televised live on the ABC Television Network at 7 p.m. ET/4 p.m. PT. "LA VENUS" the singlewill be released via Sony Legacy Recordings and available everywhere in early 2017. "Sony Music Entertainment's Legacy Recordings is thrilled to be releasing the new single, 'La Venus' from X Japan's feature documentary, 'We Are X'," says Adam Block, President of Sony Legacy Recordings. "It's a beautiful, powerful track from a stunning film that we hope will be considered for a nomination for best song from a feature film at this year's Academy Awards." Watch as YOSHIKI describes "LA VENUS" and its role in the film WE ARE X (here). 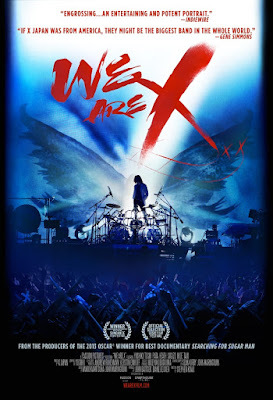 WE ARE X is a transcendent and beautifully shot rock & roll story about the Japanese rock band X JAPAN, one of the biggest rock bands in the world. X JAPAN has sold over 30 million singles and albums combined--captivating such a wide range of admirers as Sir George Martin, KISS, Stan Lee, and the Japanese Emperor--while pioneering a spectacle-driven style of visual rock called Visual Kei, a one-of-a-kind cultural phenomenon. Directed by acclaimed documentarian Stephen Kijak (Stones in Exile, Scott Walker: 30 Century Man), and produced by the Oscar-winning production team behind Searching for Sugar Man, WE ARE X is an astonishingly intimate portrait of a deeply haunted--but truly unstoppable--virtuoso and the music that has enthralled legions of the world's most devoted fans. The film continues to expand nationally in new cities every week; see the current list of playdates (here). Here is some early critical praise for the film 'WE ARE X': NEW YORK TIMES, LOS ANGELES TIMES, PITCHFORK, BUZZFEED, USA TODAYand LA WEEKLY. On January 12 and 13 2017, YOSHIKI will bring his classical show "YOSHIKI CLASSICAL: Featuring Tokyo Philharmonic Orchestra" to Carnegie Hall's Stern Auditorium/Perelman Stage in New York. For the Carnegie Hall concert, YOSHIKI will perform his original compositions alongside the world-renowned Tokyo Philharmonic; he will also play several traditional classical pieces. For tickets, visit (here) and the Carnegie Hall website (here).